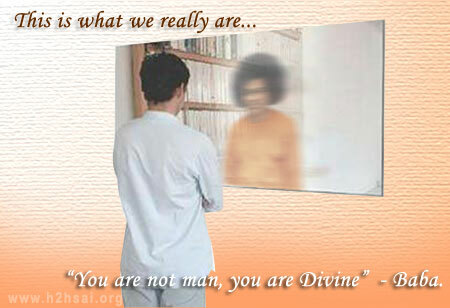 Sairam and welcome to our new series – Radio Sai Study Circle. Over four decades ago, in 1968, while addressing the delegates of the First World Conference of Sri Sathya Sai Seva Organisation, Swami said, “Many people plead for a message from Me. Well, My Life is My Message!” The focus of this series is to dwell on how to make our lives His message. 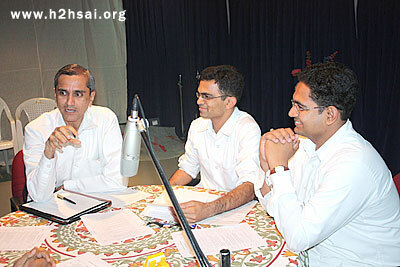 Read on as we take you through an interesting spiritual discussion that four former students of Swami’s University had in the Radio Sai Studio in August 2010. Three of them – Amey Deshpandey (AD), Sai Giridhar (SG) and K.M. Ganesh (KM) – are research scholars in Swami’s college, while Mr. G. S. Srirangarajan, the moderator for the discussion, after serving for many years as a faculty member, is presently the Controller of Examinations at the University. The other member, Bishu Prusty (BP), also a former student, currently serves at Radio Sai. Moderator: I was just wondering what topic to pick for discussion, when I was reminded of the beautiful Chinna Kathas of Swami – stories and anecdotes narrated by Bhagavan which are small but have profound messages! And as I was thinking this particular story struck me the most: it is a tale about the monkey and the pot. Swami says that in the olden days they used to have a container with a narrow neck and this jug would be filled with peanuts to catch monkeys in the forests. Are you wondering how this helped them catch the monkeys? Well, the monkey would put its hand inside and clasp the nuts. But while it was able to insert the hand in, it cannot remove it out of the pot the moment it clasps these nuts as the neck of the vessel is narrow. So the monkey would get stuck as it would not want to let go the peanuts giving an opportunity to the people to be caught. It may be a simple story but Swami draws wonderful messages from it. If you really ruminate over this, there are three messages which really come forth. The first is the delusion aspect. 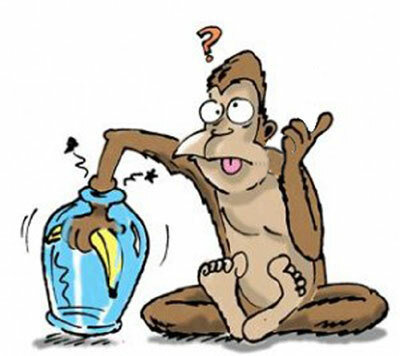 The monkey, Swami says, is under the delusion that there is something inside the pot, which is holding it back. Unable to escape, it therefore falls prey to the hunters. We all have the choice between our Higher Self, which is centred on God, or the lower self, which is focussed on body consciousness. And this is where the tragedy of the mind comes; it lacks the far-sighted wisdom and patience to explore the unlimited joy of God, which is latent within us. Moderator: So the whole while the monkey is delusional; actually it is the monkey itself that is holding onto the nuts. The second aspect, which emerges from this story, is that of attachment. Why is the monkey not able to give up those nuts? Why is it greedy for so many? After all, had it held few nuts, its hand perhaps may not have got struck in the jug! But then it did not do that. Finally, the third aspect that comes to surface is greed, rather, how one can control their greed. And as Swami says we can do this by placing a ceiling on our desires. though it is generally nuts in the jar sometimes it's a banana! So, let’s discuss these three messages today. On delusion, there’s another story that comes to my mind which is a story that Sri Ramana Maharishi narrates. He gives the example of a dog and explains how when you give it a dry bone, the dog’s gums start bleeding while it chews on it. The canine however feels that the blood is coming from the bone and actually begins enjoying it at its own cost! Height of delusion one would say! It is the same tale with the musk deer too. Swami has many a time narrated how this gentle animal runs all around the forest trying to find the source of the musk, which in reality is in its own navel. So why do you all think about this aspect of our mind? AD: That was very beautifully explained. In fact, my mind goes back to another example that was once narrated by Bhagavan. Pointing at His own car, the Mercedes, Bhagavan said, “Do you think the Mercedes gives a lot of joy?” He then followed it up with another question. “What if the same car is parked in the neighbour’s garage?” Well, in that case, all of a sudden that joy is a lot less than what it was originally. So, actually it is our delusion which makes us feel that it is the object which gives us happiness when actually the joy exists in our mind. BP: I remember a senior brother telling me that until we realise that the ‘centre of our happiness’ is not in outside achievements or experiences, but in ourselves, we can never be truly happy. For example, if someone desires to have a cell phone and for some reason if his wish didn’t materialise, he feels sad. That is because his ‘centre of happiness’ is in the mobile and not in himself. 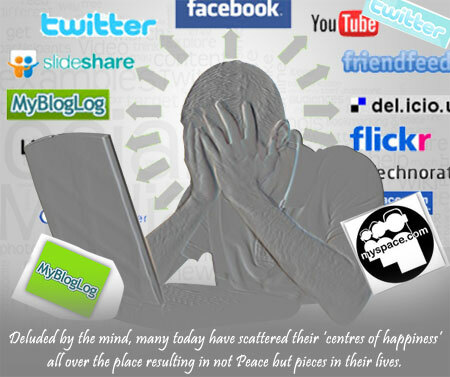 If you see the situation today, many people, especially youngsters have their ‘happiness centres’ scattered all over the place, especially on Facebook, Twitter, etc. They spend hours playing video games and connecting with people, collecting all sorts of information, a large part of it may be trivial’; they do this just to get some sort of happiness out of it. Eventually what happens is that they get addicted to it. In fact, I recently read how in South Korea the Government has declared internet addiction as a serious mental malady and even has set up clinics and camps to address this problem. There actually is a very sad story of a couple who got so engrossed in playing a video game that they forgot to look after their own infant. The baby actually died! So that is how serious it is. The point I am trying to make is that these things happen when we place our ‘happiness centres’ outside. Swami always says what you get outside is not Peace; Peace is in fact inside, outside we get only pieces. It is being just like the monkey, which thought that its joy would come from the nuts. And in the process we become nuts! KM: I feel the objective world is purposely designed with its delusory attractions. One may ask why. Don’t you think the Creator has deliberately made this world phenomenal and enigmatic with its own delusory charm so that the creation continues? It is programmed that way. But in His Divine Algorithm, He has also put a decision box where one can choose to be either played by maya (illusion) or play the maya. We all have the choice between our Higher Self, which is centred on God, or the lower self, which is focussed on body consciousness. And this is where the tragedy of the mind comes; it lacks the far-sighted wisdom and patience to explore the unlimited joy of God, which is latent within us. And brother Amey pointed out we are too busy seeking joy from the outside world. That also reminds me of a beautiful analogy given by Sri Ramakrishna Paramahamsa. He talks about the grain dealer who stores his rice in huge bags in the warehouse. But in order to ward off rats he also puts some puffed rice in a tray purposefully near them. Now, this puffed rice attracts the attention of the rats and they nibble at it throughout the night. So while the rodents are right next to tons of rice, they don’t even seek it! And when you realise that actually one unit volume of rice can yield as much as fourteen unit volumes of puffed rice you know how this delusion works. It tells us how infinitely superior the joy of God is to worldly pleasures! It ultimately boils down to the choices we make every moment. Moderator: Okay Ganesh, so you say that the rats actually went to the puffed rice, leaving out all the bags of rice. Does this really happen? KM: Yes, because the puffed rice is kept in the open. Moderator: Well, human beings aren’t much different then! Why are our minds like this, Giridhar? Why do you think we still go behind the tinsel when there is something far superior? SG: What comes to my mind is this beautiful story regarding willingness to change or, as Ganesh put it, the power of making the right choice. There once was this man who suddenly started believing that he was a rat. Obviously, there were problems at home as he would often hide behind furniture or go below the couch! The family decided to take him to a psychiatrist, who did a beautiful thing - something which Swami does to us all the time. First, this doctor put a mirror in front of this man. Then, he brought a cage in which there was a rat. Now, pointing to the rat and the man’s reflection on the mirror, he explained to him how he was really different from the rodent. The psychiatrist continued with this exercise for a few days. Weeks passed by, the treatment was going on well. And family did find that the man was free from this delusion. And so, one day they all returned to the doctor along with that man to thank him. As they were all talking to each other that day, the man hid under the table again! The psychiatrist was shocked; he asked him what was wrong. The man replied, “There is a cat on the wall!” The doctor then reminded him how he wasn’t a rat anymore. The man nodded and then said, “I know I am not a rat, but what about the cat!” I think all our stories are somewhat similar to this. Moderator: It is really very profound when you think about it. Incidentally, our story is about the monkey and Swami says we have ‘monkey minds’. The mind is like a monkey, not just an ordinary one; it is a monkey which is drunk and also bitten by a scorpion! So how do we get over this deluding aspect? How to deal with greed? Why is the monkey holding on to the peanuts? Is it attachment? I think the next message that comes out is how do we develop a sense of detachment? Why are we so attached to the pleasures of the world that even the superior and everlasting bliss that one gets from God doesn’t seem to be attractive enough? I remember how Swami always used to say that it is very tough to develop detachment. He says that as human beings we cannot really develop this virtue. However, we can cultivate attachment to God! Bhagavan gave the example of a seesaw to explain this: Just like how when it goes down on one side, the other side goes up, Swami said that the more we get attached to God, the more we get detached from the world. So the mantra He gave us was - Remain God-centric. SG: In fact, Swami has narrated another story concerning this. There once was a king who arranged a fair and gave an open invitation to all his subjects, welcoming them to come and pick up any item of their choice. Everyone was choosing what their preferences ranging from pieces of art and jewellery to even weapons. There however was one lady, who was looking at everything but hadn’t taken anything. The perplexed king went to her and questioned her on her behaviour; he wanted to know if the lady really did not like anything in the fair. And then he told her she could ask for anything and he would give it to her. The lady replied, “Oh King! It is not that I don’t like anything in your fair. They are all very beautiful; but I am not interested in them.” The king immediately realised she was very wise, and urged her to ask for anything. He promised he would give it to her. Do you know what the lady desired? Any guesses? The lady chose the king himself. Doing so, she not only got the king, but the entire kingdom! The fair was after all only a small part of the kingdom. BP: I am reminded of the Biblical Quote: Seek the Kingdom of God and everything else shall be added unto you. BP: Giridhar, while this is a great story, and it may sound simple, but it is not that easy in real life because man does have so many desires. We cannot really live without desires; however, there are ways we can deal with them, through three methods to be precise. One, you yield to them. So, what happens when you do this? Well, they only increase. It is like putting oil into fire; it only burns even brighter. The second way is suppressing them. But this helps only temporarily; it actually backfires. For example, there are occasions when we fast either because the religion demands it or someone else asked us to do it. 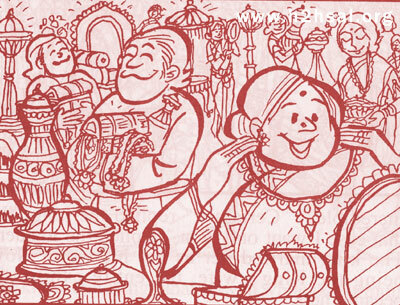 But the moment this ritual is over, we land up eating tons of food! It is like a spring effect. And also during the fast, our thoughts are constantly on the food; waiting for the time period to end. So, this too really doesn’t work. The third way is to sublimate the desires. What we do here is replace it with something higher and nobler. Speaking of this, I am reminded of a beautiful experience of one former student of Swami’s University, Gopal Indhreshwar Singh, who is from a royal family. He narrated how a man named Kishore had befriended and won the confidence of his grandmother. And being a clever man he had actually helped himself to many assets and even bank accounts of the family! After hearing him out, Swami said, “Do you realise that you have committed three murders!” Gopal was shocked. Swami added, “Yes, you have killed him thrice,” and then went on to explain how in man’s laws we commit a crime only when we actually do the evil act physically. However, in God’s laws even when you think about it you have already done the action and have to face the Karmic burden. 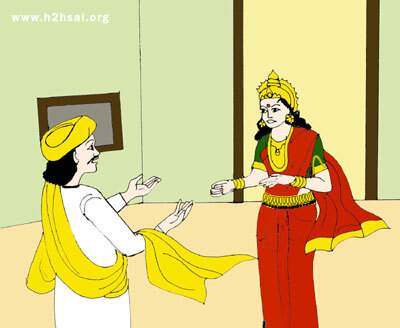 Gopal was totally taken aback; he didn’t know what to do. He now started begging for forgiveness. Swami then said, “Okay, tell Me Gopal, now what you feel about Kishore?” Gopal apologised for what he was doing and then added that irrespective of that his feelings for Kishore hadn’t changed a bit; for him Kishore was still a wicked man. Swami then said, “Fine, close your eyes now and box him to your heart’s content.” Having received Divine permission, Gopal now went back to his game enthusiastically; he started hitting Kishore black and blue, with full vigour and vengeance, in his imagination. The fight came to a point where they were on a cliff. And now Gopal gave a big blow. Kishore was about to tip off the edge. Then suddenly, Swami appeared in the scene and said, “Gopal, can’t you see? Did you not observe what Kishore is carrying?” Gopal then noticed that Kishore had a small baby in his arms, and this little bundle of joy was really cute and sweet. Gopal now said to himself that there was no way he would allow this baby to perish. So, immediately he jumps forward and embraces Kishore. To cut the story short, Kishore is saved and so is the baby. Besides, Kishore is now a transformed man and grateful to Gopal for protecting him; so much so that he now wants to offer everything that he has to Gopal. The learning was that when we have hatred, we should visualise an object or a thing which draws love out of us. We should then ensure that this love engulfs the whole atmosphere as also the person. That is the way to ensure we don’t have any karmic burden. That is also the manner we can replace our lower desires. Gopal’s hatred was now replaced with Love. So, the only way to deal with desire is to replace it with something lofty and nobler. Detachment is not about giving up anything, but just replacing lower desires with something nobler - perhaps by choosing Swami in every moment of your life. But there is also some deep sense of security complex, which lurks within us without our knowledge. It could be some current relationships, beliefs, lifestyle choices and so on; these things bind us down and we refuse to let go. Why does this happen? Swami says that wisdom and renunciation are the two wings of a bird. Wisdom without renunciation is useless, while renunciation without wisdom is foolishness. In this regard Bhagavan also mentions how most of the rich in the society do not know what to do with the money they have; they lack both wisdom and renunciation. He compares them with a dog, perched on top of a hay stack that’s barking at the cattle who want to feed on the hay. Neither can the dog eat the hay, nor does it allow the cattle to consume and satiate their hunger. Such is the predicament of society today. If you were to look at the rat of Ganesha, it has a little modhakam (a steamed sweet made of rice flour and jaggery) in its hand, with its eyes all the time fixed on the Lord’s eyes. Bhagavan compares that modhakam to wisdom and explains how the rat’s eyes are on the Lord’s eyes, its Master, also known as Vigneshwara, the remover of obstacles. In a similar fashion, Swami says, if we keep the Lord in our minds and make Him its Master, we will have nothing less than the fruit of wisdom in our hands. It is a beautiful way of sublimating oneself. KM: Wow! Only Swami can give such beautiful examples! It is time that we do some soul-searching to find out the exact source of happiness, that is, lasting happiness and follow it up with a decision to give up all the instinctive habits of greed and possessiveness. We must realise and be aware that true happiness lies in giving and not in grabbing and accumulating just like how the monkey was trying to do in the story. Moderator: Exactly. This is what brings me to the third profound message in the story, which is keeping a check on desires. If at all the monkey would have given up a few nuts, it would have been free! Then why is it holding on to that? Ganesh rightly pointed out happiness truly lies in fewer desires. Swami says that he, who has the least desires, is the happiest man in the world. BP: He is the richest who is most content. Moderator: Right. I remember General Chibber giving this particular formula for happiness. 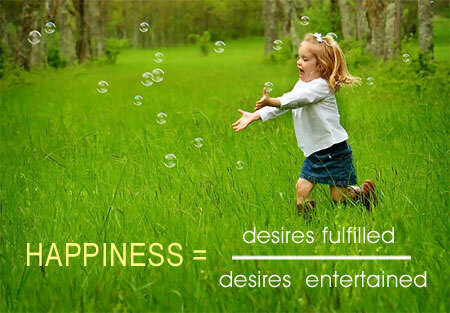 He said that happiness was equal to the number of desires fulfilled divided by total number of desires entertained. Either you increase the numerator or decrease the denominator. But I guess you will all agree that we do not really have a control over how many desires can be fulfilled; it is a function of so many things. But then we definitely have a say over reducing the number of desires. So don’t you think this story of the monkey and the pot and the nuts also tells us that man should have a check over his desires? 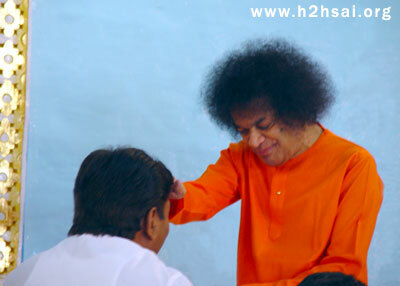 Note that Swami does not say no to desires, He only urges us to have a control on them. AD: You are absolutely right. If only the monkey had held on to a lesser number of nuts, maybe he would have been happier and not got caught too. It is only our greed. What if the monkey had taken only one nut at a time? 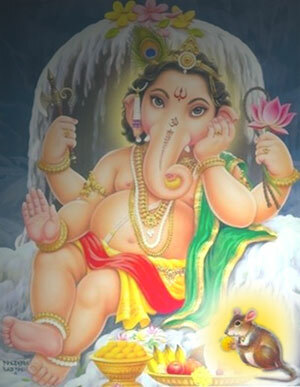 AD: A very senior gentlemen of our University once told me about how we often see the rat next to Lord Ganesha! He went on to explain that if we actually look at the rat, we will notice that it has a little bill of its own. It goes outside and picks up all sorts of tinsel and trash. In fact, he said that if we were to make a list of stuff that rats pick up, we will find all sorts of things captured ranging from plastic, paper, cloth, batteries to food items, making one wonder if the rodent really requires it all. He then went on to state how Swami says the same thing about our minds! We just keep dumping so much trivial stuff from outside into it. If we actually were to open our mind and examine it, we will have a whole gamut of absolutely unnecessary things always clouding it. But then Bhagavan gives this punch line: If you were to look at the rat of Ganesha, it has a little modhakam (a steamed sweet made of rice flour and jaggery) in its hand, with its eyes all the time fixed on the Lord’s eyes. Bhagavan compares that modhakam to wisdom and explains how the rat’s eyes are on the Lord’s eyes, its Master, also known as Vigneshwara, the remover of obstacles. In a similar fashion, Swami says, if we keep the Lord in our minds and make Him its Master, we will have nothing less than the fruit of wisdom in our hands. It is a beautiful way of sublimating oneself. KM: If you think about it what is important is to define our needs and desires. But then it is significant to know where to draw the line. Let me give an example that will explain how distinguish between need and desire. I am sure all of us have worn shoes at some point of time in our lives. How do we buy footwear? By making sure that our feet exactly fills the inside of the shoe. If the size is bigger or smaller than that of our feet, we feel uncomfortable. The desire for money should also be placed in the same way in our lives. Too much aspiration for money causes unnecessary discomfort. On the other hand, living like a miser too isn’t advisable. SG: In fact, Swami gives another dimension to ceiling on desires. As Ganesh said earlier He doesn’t say we should have no desires. He instead says that ceiling on desires simply means not wasting the existing resources, that is, one should not waste food, energy, time and so on. These are all simple things in life, which contribute greatly to the fulfilment of our own desires. BP: I was just thinking about the shoe analogy of Ganesh and now I was reminded of an anecdote, which Swami usually gives, of a person who did severe penance to propitiate Goddess Lakshmi (Goddess of wealth) because he wanted wealth. The Divine Mother was pleased and appeared before him. She asked him what he wanted. 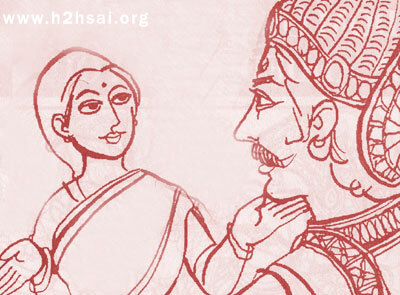 He was absolutely delighted seeing that the Goddess had appeared adorned with all jewellery. He asked her to come to his house. She said, “Definitely. You have pleased Me, so I will visit your home. Not only that I will also give you all the ornaments I have. However there is one condition. You should lead the way and I will follow you. And you must never turn back to look at Me even for a second. In case you do this, I will instantly stop and disappear.” The man agreed to the condition and led the way. As he was walking he heard the tinkling sound of the jewels; he was delighted but at the same time after a while he was unable to resist the temptation to see what he was really going to be rewarded with. He convinced himself that he would turn and see just for a split second. And the moment he did that the Goddess was no where there. Swami gives this example to illustrate how this man, who had got so much grace from God and was in fact going to be rewarded handsomely, lost it all because he could not limit his desire. It is the same thing which Swami tells us often: “I am here giving so much…but your vessel is turned upside down; you are not benefiting from Me.” By controlling our desires, we can achieve so much. Moderator: These are the moments of truth. One instance of desire is enough to make us lose ourselves in the world and forget God. Let’s move on to something more practical, that is, how exactly can we put these into practice? At the brass tacks level, how can we start doing this right now in our lives today? Can you give me some tips? KM: Swami tells us that desire is like a cobra that we hold on to thinking it to be a harmless rope, until one day it coils us completely into helplessness and bites us. While the perception of a lethal reptile at any moment would instantly make us throw it, it isn’t the case when it comes to cigarettes, alcohol, drugs or even traits like short temper or obsessive desires. We are apparently reluctant to give it away. Why, because we don’t see the potential imminent disaster that hides behind these habits. If one goes to cancer hospitals and sees a lung cancer patient suffering with intolerable pain due to his serial smoking habit or goes to a rehab to see the alcoholics struggling to get out of the drinking addiction, we can get a feel of the seriousness of the issue. One glimpse of such a situation probably will be enough. It would serve as an eye opener to the ones who are in the early stage of developing such habits and are feeling reluctant to give them up. But what if someone does not have such dramatic exposure in the early stage of addiction or say they don’t have opportunities to see the terminal stage of these problems? Swami has given solution for that too. Once, a devotee confessed to Swami that he was struggling with his bad thoughts and was unable to get over them. 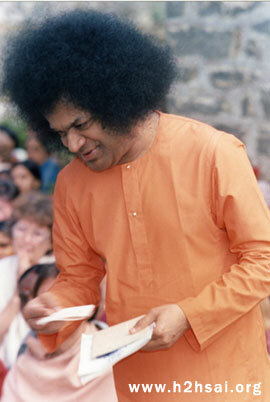 He happened to hold a letter in his hand as he put forward his plea to Bhagavan. Swami took that piece of paper and rolled it. He then gave back the letter to the devotee and asked him to straighten it. The person did that, but every time he left it, it would roll back. This happened three or four times. Then Swami took it back again and rolled it in the reverse direction. And there it was! The letter stood straight as it was before. Bhagavan then remarked, in His inimitable way, that instead of working on our short comings, we must start or develop a new habit. If we focus our energies this way, the bad traits or activities of lower energies will shed on their own. Sri Ramakrishna devised a very beautiful and innovative method. He gave him a chalk piece and said, “You should have only that much opium as the chalk weighs. But what you should do is write Om with this chalk everyday. Then weigh and take that much opium.” The man was quite surprised as to what the connection between writing Om and taking opium was. But what he did not know was, subconsciously, writing Om everyday had its positive effect on him. The chalk was reducing, and with that the weight of the opium he was taking in. So when Bhagavan gives the example of dramatically making a change to our habit on one hand, He also says we can actually reduce it by making those gradual improvements, through step by step processes. In fact there is another example of somebody who asked how he could measure the level of spiritual progress he had made. The answer to that was every time one moves away from equilibrium, that is, from the inner state of peacefulness, how much time does it actually take them to come back to that equilibrium. That would be a good measure of how much spiritual progress one has made. For example, suppose when I get angry, I am disturbed for an hour after that. 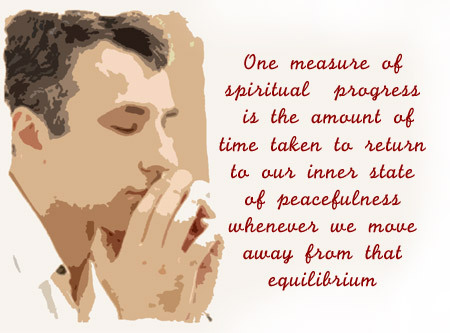 With my spiritual progress, I can reduce it to say maybe half-an-hour or fifteen minutes. Such a self-audit, the step by step movement towards perfection, I think is another way of actually over coming greed. BP: Amey, you mentioned about self-audit. I want to talk about another kind of this self-examination that Swami talks about. He says that if we examine our lives, we would find that there are many assets and possessions that we actually do not need. More often than not, we possess an object for some time, use it for a while and then slowly get attached to it. It then becomes indispensable in our lives. For example, take the mobile phone. Ten years ago none of us had this gadget. Now cell phone has become almost another organ, an extended limb of our bodies. But what I liked most was the conversation on self-audit. It is not about how much I have achieved. Swami always tells us to ask – “Am I better than yesterday or last month?” So Bhagavan is basically prodding us to improve gradually. He knows changing dramatically is tough for us. These short stories from Him have such profound lessons! Take a count of the many assets that we have in our homes, drawers, cupboards, etc. We will realise that we bought most of it because we saw someone else having them. We probably felt buying it would give us a position among our peers, or make us in tune with times. Swami says we have to examine all those assets and habits which are expensive and unnecessary, and see how we can reduce them. This is important not only spiritually but also materially as it helps us to limit our expenses. I guess this is something we all can practise. SG: Speaking about practice I actually have a personal experience. Once, Swami told us that coffee was bad for health. SG: I am coming exactly to that. What I did was I tried to negotiate with my mind. I said, “Ok, I will not drink coffee regularly because Swami has told it is bad for health.” So I told my friends I was a social drinker of coffee, that is, if they offered me coffee I wouldn’t say no. That was the first step I took but I soon found out that it did me no good. Then I thought I should be intelligent with myself. So I said, “Oh mind, I will not give you coffee, I will give you cappuccino, which is some amount of coffee and chocolate”. That was perhaps the deluding aspect of the mind. But somehow the mind did believe that for some time and so it went on for a while until recently I realised that when coffee was being served somewhere, my taste buds would activate my mind! I couldn’t resist that smell; its taste was coming back to me again. I realised that neither negotiation nor intelligent tactics can help in giving up desires; there needs to be a strong willingness to change. BP: I think this is very important. We should not ever compromise on what we ever decide to do. For example, there are many of us who would have decided that we would not watch T.V. and would have started off with seeing maybe only news and some select programs, but then slowly we start making concessions, and pretty soon we are getting nowhere with our vow. SG: One thing I realised is that first I had this perspective that coffee is bad for health. So I told myself that I should not drink coffee. But then even that perspective of physical health being affected was not good enough for me. Only when my mind started playing tricks with me, did I tell myself that it is more important for me to follow what Swami has told. That way my mind began to change. So let me quickly sum up all that we have discussed. We started with the wonderful story of the monkey, the pot and the nuts. The three aspects highlighted in the story were the deluding aspect of mind, the sense of being detached to the worldly pleasures, and placing a check on one’s desires. Eventually when we came to brass tacks of it we dwelt on the practical tips to achieve these. Swami, the amazing democrat that He is, is so open and all-inclusive. He has given us both options: One is a slow option, the example of chalk and opium and the other the example of rolling and unrolling the letter in opposite directions, basically replacing lower desires with nobler ones. The second way, just like how we leave a snake the moment we know it is a reptile, is to quickly give up bad habits. Both are essential and an optimal mix of both is what we need. However nothing can be achieved without a strong will.